“I simply must find a way to teach this to my pre-schoolers!” Ellenella was enthusiastic and adamant. Curled up in front of the welcoming fireplace with its ever-changing kaleidoscope of flash and flame, we had been discussing a concept we call the “Emotions Staircase.” After having learned the concept herself, she had practicing identifying core emotions—gleaning the information each was designed to provide, taking appropriate action, and choosing which feelings to hang onto (if any). Now the woman was passionate about helping children learn similar skills “fifty years sooner than I did,” as she was wont to say. “It does make life seem smoother,” I agreed. “No longer is one held hostage to emotions and feelings, all of which can seem frightening and powerful at the same time.” Understanding the concept of the Emotions Staircase and taking responsibility for climbing up to joy had been one of the most empowering strategies I had ever put into practice. Almost immediately half of the problems in my life had slid off the back of my metaphorical truck. For the next hour, over popcorn and apple slices, we brainstormed. “I’ve got it!” Ellenella’s exclamation rattled the embers to say nothing of my ears. Jumping to her feet, she was on a dead run to her office. In moments she was back with cardboard, scissors, felt pen, yarn, hole-punch, and cartoon stickers. “This is what I’ll do,” she enthused, but what that meant was unclear to me. Fast forward six months. Same welcoming fireplace, a replenished supply of popcorn and apples, and a calmly satisfied Ellenella. “It worked,” she said, simply, “and do I have a success story for you!” I refilled my bowl with popcorn and apple slices, snuggled a bit deeper into the overstuffed sectional, and prepared to listen. Furious fuming little Farquart (as Ellenella described him) had been enrolled in her preschool at age three. Suffice it to say, his home-life was difficult. His parents, angry that they had been unable to settle their differences, had divorced. But they had continued squabbling—over everything. Little Farquart in particular. He was their bargaining chip, their emotional punching bag, and the prize whenever each parent perceived he or she was winning. No surprise, their only child was one angry little boy. At the age of three his language abilities were insufficiently developed for him to articulate the devastation occasioned by his parents’ abject immaturity, so he had taken to acting out his frustration and insecurity by throwing things. Any object he could pick up or push might become an instant missile. Not only was this rather unsettling in the preschool environment, it was unacceptable role-modeling for the other children. A contractor friend built for her a child-sized staircase with a fancy handrail. Once it was painted and installed in a corner of the school’s great room, another of Ellenella’s friends had painted a matching cartoon face on each step. Ellenella had pictures of the staircase and the cartoon faces on her computer. They were hilarious! Ellenella began teaching the preschoolers by using words and actions. Hers. She talked about the emotion of anger when her boundaries had been invaded, as when the postal delivery van was backed into the school fence, taking down a 12-foot stretch. She talked about the emotion of fear when she was in danger, as when a rattlesnake had slithered onto her front porch. She spoke about the emotion of sadness when she experienced a loss, as when her little lovebird squeezed out through an opening in its cage and flew away. And she talked about the emotion of joy when life was basically going well. 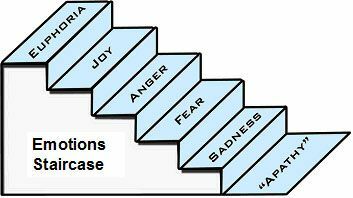 And when Ellenella talked about an emotion, she would stand on the matching step of the Emotions Staircase. Gradually the children began to copy her role-modeling, running over to stand on a step while mimicking the related cartoon picture and saying “fear” or “sadness, ” and so on. That was only the first step in Ellenella’s plan, however. “I want them to be able to identify the emotion whether or not there is a real Emotions Staircase present, and to articulate the feeling they choose to hang onto.” That would be a large order for the average adult—to say nothing of a child. But Ellenella had persisted. Little Farquart had quickly latched onto the reality of the Emotions Staircase and seemed to enjoy running over to stand on one of the steps. Before long he was able to articulate the feeling he had chosen to hang onto and did so with an almost visible sense of relief. No surprise, over time the number of items he heaved across the room or shoved across the table decreased to almost zero. Ellenella’s success story involved a situation that had occurred at the preschool on the day of Farquart’s fifth birthday. That particular morning, when his mother dropped him off at school, she also dropped off a batch of big, luscious, homemade chocolate chip cookies—one for each child and each teacher. The cookies had been made to resemble happy faces with eyes, nose, and mouth fashioned from M&Ms. The treats were stored in the kitchen to wait until lunch. Out of sight. As the children arrived at school, each went directly to his or her wall hook and selected a label printed with the word that described their current feeling. Most of the children would hang happy around their neck and only change the label if something happened to warrant that. Little Farquart hung the happy sign around his neck. After all, it was his fifth birthday and there were special treats for desert. It was a lovely summer’s day, so lunch was served out in the playground beneath spreading trees. When the meal was finished, the cookies were distributed. Little Farquart, as Ellenella explained, had sat on a stump and gazed soulfully at his cookie. “Are you going to eat it?” one of the teachers asked. “Oh, yes!” exclaimed Farquart. “But first I’m joying it.” Unfortunately, he didn’t have long to joy. Without so much as a warning bark, a huge Great Dane bounded through the open gate, neatly plucked Farquart’s big, luscious, home-made chocolate chip cookie from the boy’s hand, leaped effortlessly over the six-foot fence, and disappeared from view. There was a whole minute of stunned silence before Farquart broke it. “Run into the school and get your labels.” The boy obeyed and returned with three labels looped over his arm. “Which one do you want to put over your happy label?” Ellenella asked. “No,” said Ellenella, at which Farquart’s screaming and jumping became accentuated by giant sobs. Rivulets of tears coursed down his face. The five-year-old placed the bad-sad label around his neck. After a few minutes, Farquart hung the Scared label around his little neck. (Ellenella had taught the children to identify the lowest step—core emotion—they were experiencing and then to walk up the staircase to joy, step by step.) “What are you scared about?” Ellenella asked the boy. “I scared that dog’s gonna steal my cookie again!” said Farquart, emphatically. “You’ve been yelling and jumping for twenty seconds,” Ellenella answered, patiently. For a moment it looked as if Farquart might continue his mad antics, but almost as suddenly as he had started, he stopped. “I’m just happy,” said the little boy. “I’m tired of being mad.” So saying, he hung the happy label around his neck. He removed the other three labels and went into the school to hang them on his hook. “Are you giving me your cookie?” His little eyes sparkled with joy and hope. “I am sharing my cookie with you,” the teacher responded and handed him half her cookie. At this, little Farquart began to jump up and down again. His little face was wreathed in smiles and the gap occasioned by a missing tooth showed clearly. “What do you say?” prompted Ellenella. “I say Gracias!” shouted Farquart, using one of his new words. “I say Gracias, Gracias!” The teachers smiled as Farquart continued, “I’m BIG JOYING!” He ran off to join his friends, nibbling his cookie with obvious pleasure. Note: Additional information on Emotions and Feelings and on Emotional Intelligence may be found in Brain References.